♥ Mama 2 Multiples ♥: Purex Crystals Dryer Sheets Review & Giveaway! As a mother of 4 little ones, laundry is a never ending chore in our home, and always at the top of our priority list. That's why I am such a huge fan of laundry products, and love trying out new detergents or other items for our laundry at home. I was very excited to try out new Purex Crystals dryer sheets as Purex Insider! I was sent one box of Purex Crystals dryer sheets in lavender blossom scent. I could smell these dryer sheets before I even got them out of the packaging from the delivery service! Some people might consider them a little "too strong" for their liking, but if anyone knows me, they know I LOVE things to smell good and I love scents. No scent is too strong for me unless it's a scent of something I don't enjoy. Not only do these dryer sheets take the static away from our laundry and leave our clothes (especially towels) feeling super soft, but everything smells AMAZING!! I thought I had found my favorite dryer sheets in the generic store brand ones we were previously using, but I was very wrong! Now I see what my REAL favorites are, and I will continue using Purex Crystals dryer sheets for the rest of our laundry needs! And the best part? I want to share these dryer sheets with all of YOU lovely readers! 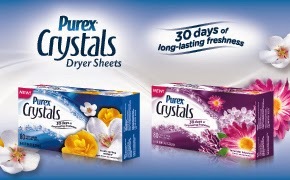 THREE lucky readers of Mama 2 Multiples are going to WIN a FREE box of Purex Crystals Dryer Sheets! To enter simply follow the instructions and fill out the giveaway form below!